Arlene Foster has been urged to clarify who is speaking for the DUP when it comes to Brexit negotiations, amid claims the party is sending out wildly conflicting signals. 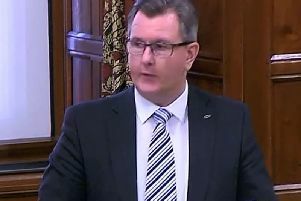 UUP MLA Steve Aiken pointed out that while the DUP leader had called for “cool heads” as the talks enter a crucial stage, other members of the party have said they are preparing for “guerilla war” against any measures that would create an economic barrier between NI and Great Britain. On Monday, DUP deputy leader Nigel Dodds threatened to frustrate Theresa May’s minority government should any Brexit deal “break up or fracture” the Union. South Antrim MLA Mr Aiken said Mrs Foster’s plea for calm ahead of Wednesday’s crunch European Council summit was in “direct contradiction” to comments attributed to other senior members of her party. He added: “Mrs Foster needs to clarify who it is represents the DUP view on Brexit negotiations. “Does Mrs Foster represent the views of the DUP when she calls for ‘cool heads in what is a very febrile atmosphere’, is it the DUP’s Westminster leader when he talks of crippling the government’s domestic agenda, which I assume could include health, welfare, business, defence, or is it an anonymous senior party official who speaks of ‘squeezing their b***s until their ears bleed’? On Monday, Mrs May insisted that a Brexit deal is still “achievable”, despite deadlock in negotiations over the thorny issue of the Irish backstop. But hours after the prime minister’s statement to the Commons, European Council President Donald Tusk warned that the UK is “more likely than ever before” to crash out of the EU without a deal. Speaking in the House of Commons after the PM’s statement, Mr Dodds called on Mrs May to hold to her pledge that Northern Ireland will not be “carved off” from the rest of the UK by a customs or regulatory border in the Irish Sea post-Brexit. Later, in an interview with BBC Newsnight, the North Belfast MP warned that his party would paralyse the Conservatives’ domestic agenda if the PM breaches the DUP’s red line on the backstop.